One of my favorite things is to receive a photo from someone. They saw it and thought of me and the blog or just saw it and thought it was something I would like to see too. Mary sent me this one and when I asked she said I could use it she said okay. Just yesterday Rufus was writing about the last of the neighbor’s fresh tomatoes. He was concocting the great looking shrimp tacos. 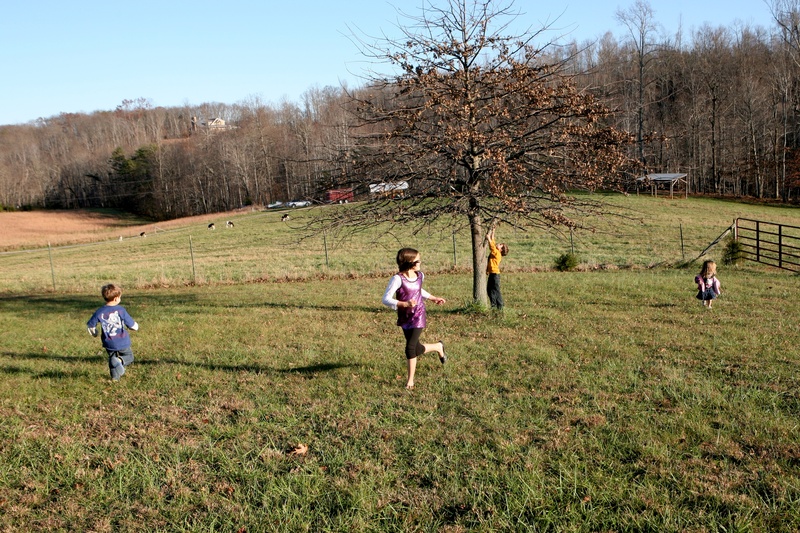 He mentioned being told about a mystery ingredient for their growing so well and his neighbor has horses. Hmmmmm. My sister sent this sign two days before. Seemed like a good link to a similar topic. Horse #@%*! In Pittsburgh there are signs about dog owners being responsible for picking up after their dogs and if not a $300 fine will be charged. I have never seen a ticket issued and I live across the street from the park. But this is not about dogs and their irresponsible after they do their business. This is about the sign my sister found in New York City and photographed and sent to me. It is about wondering the size of bag/container one would need to do such a task. And wondering where they put the matter once it is cleaned up. And what the price of a fine might be in New York City if someone did not comply. When was the last time you took a hat to be cleaned? Another shot from downtown Roanoke. My son Mark spotted this signage across the street from the Weiner Stand. Unfortunately there were cars parked in front of the establishment so couldn’t get the whole storefront. 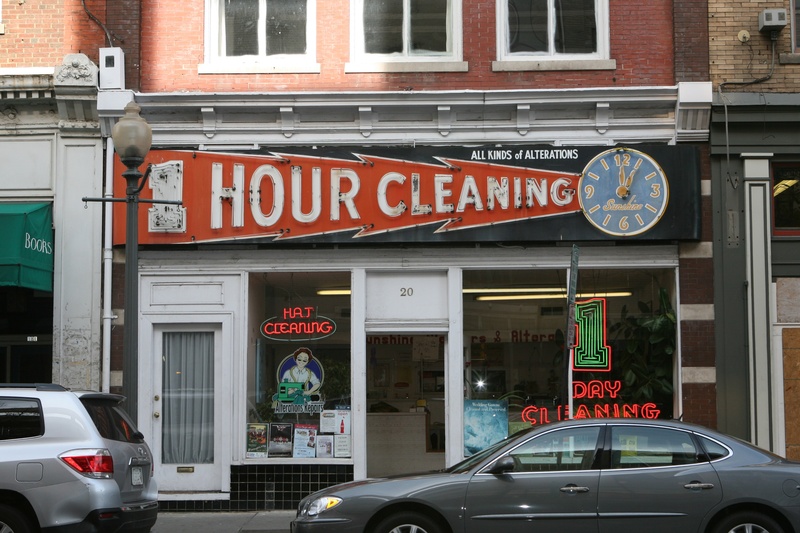 Just made me wonder when the neon sign for Hat Cleaning was installed. Thanks Mark for pointing this one out for the blog post. I guess I could have included it in yesterday’s Downtown Roanoke slideshow but I think it can stand alone. My father wore a hat. Mark has one of his grandfather’s hats his home office. I think men in hats look distinguished. My cousin Jim likes hats. He liked the post of Meyer the Hatter in NOLA. Maybe the sign is for women’s hats to be cleaned as well. I shouldn’t assume it’s for men’s hats. And I ate their specialty- Chicken and Waffles. What else? 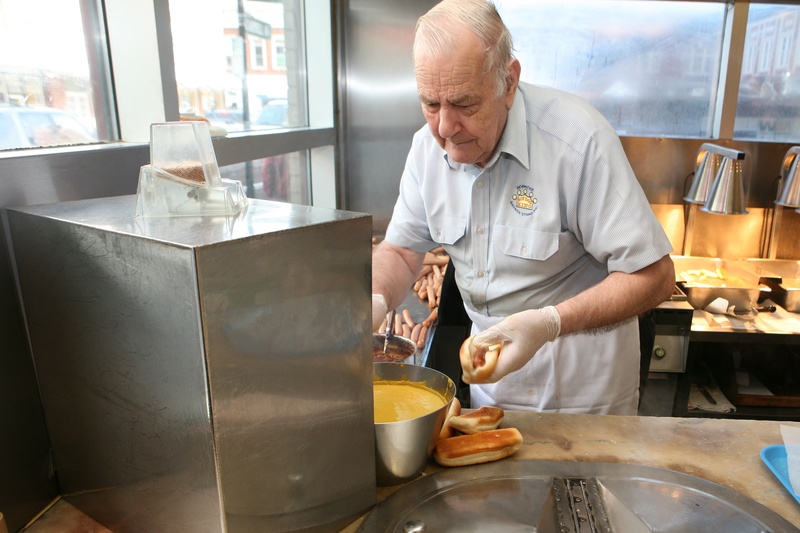 oh yes, that would be a side of home fried potatoes. and this man in the cowboy hat was explaining how bottles have belly buttons- an outie vs. an innie hmmmmm! 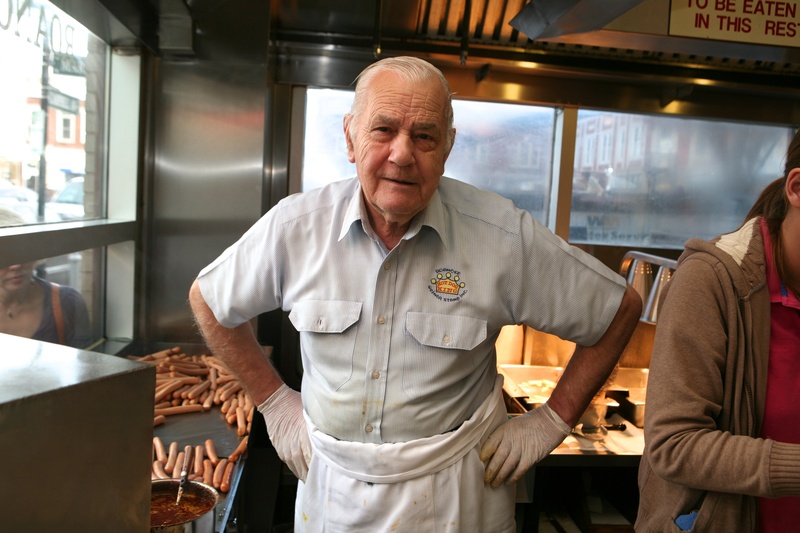 Mr. Johnny Liakos has worked here at the Weiner Stand for MORE than fifty years. 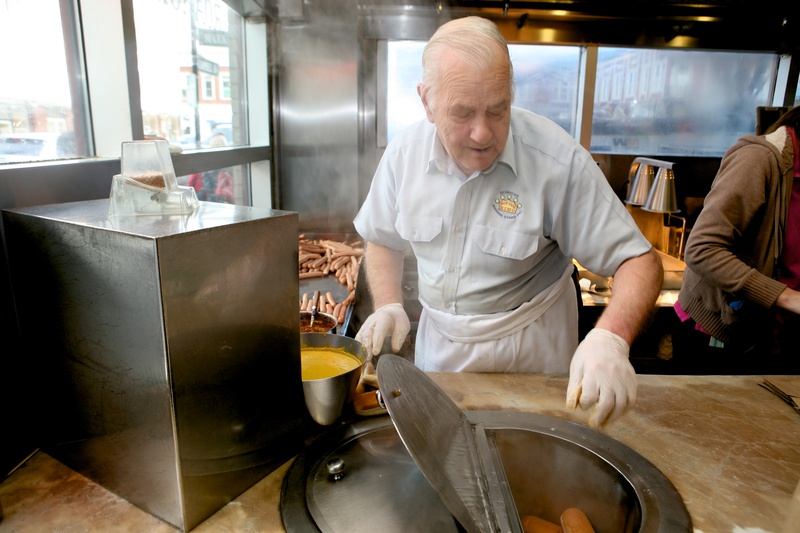 Here is an article on him and the famous hot dog stand in downtown Roanaoke, Virginia. I was photographing him through the side glass window, reflection and all and he motioned for me to come on in and photograph him. Seriously. And he stood there waiting for me, interrupting the flow of bun and dogs for a full minute. 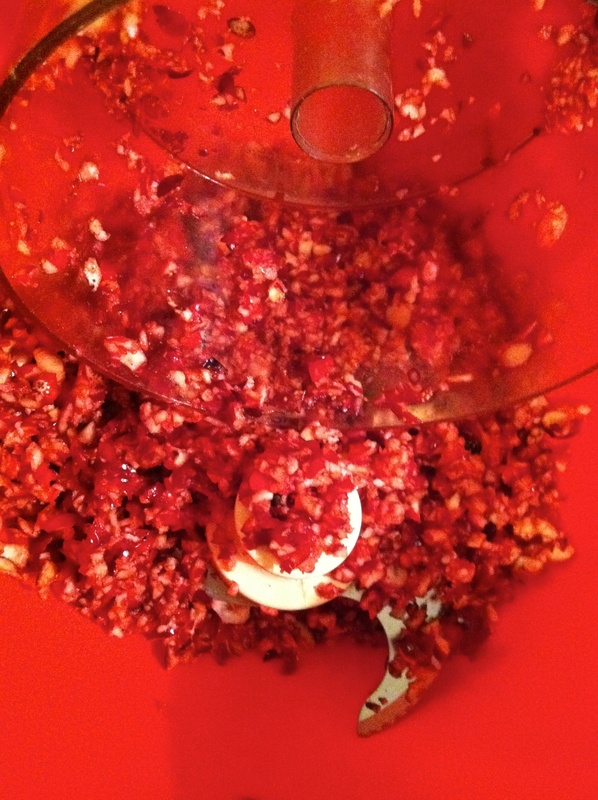 The annual making of the cranberry-orange relish. I don’t make this any other time of year.I’ve heard lots of different renditions of cranberries and everyone has their favorite. My mother used to use a metal meat grinder and screw it onto a table or chair with a woven potholder to keep the wood from being marred. 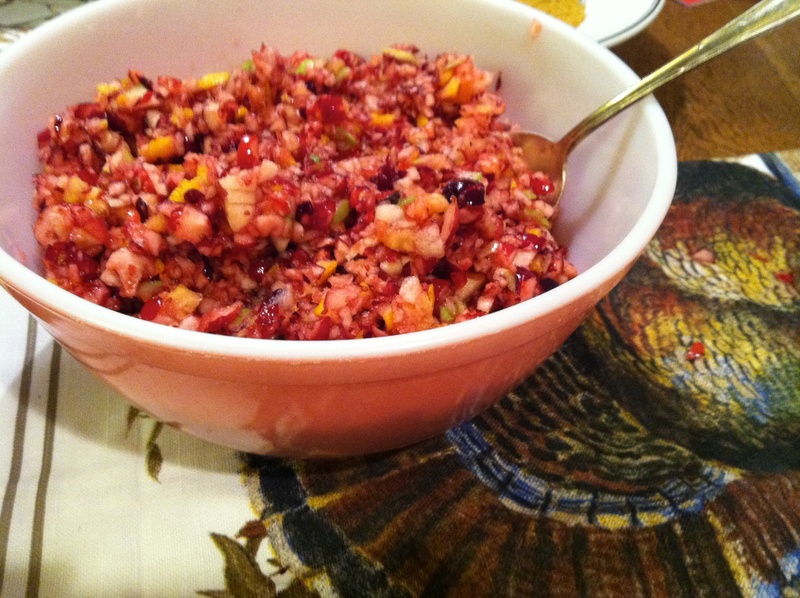 Her recipe was strictly cranberries and navel orange. I add a Granny Smith and today a HoneyCrisp as well. 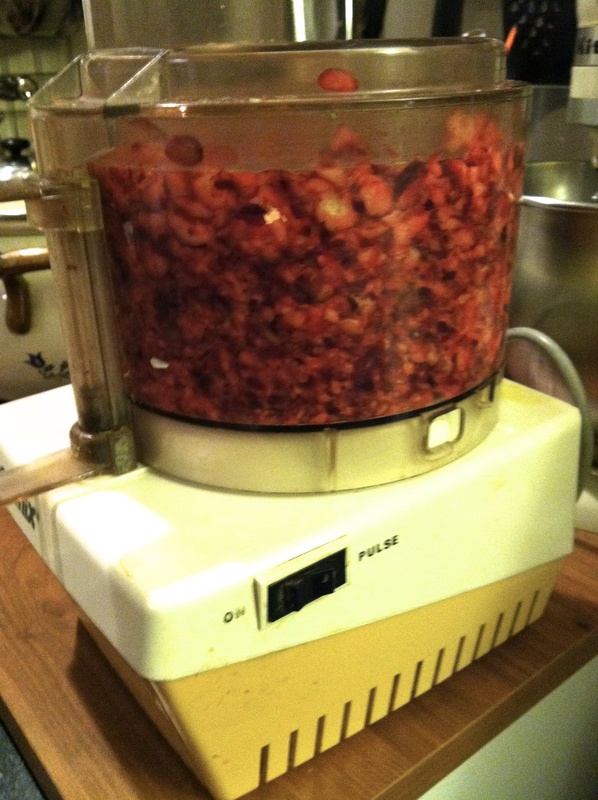 I used to have one of those grinders and ground relish with Mark when he was a boy in the same manner as my mother. My friend J from Omaha gave me her MagiMix French Processor when she got a Cuisinart. That was more than 25 years ago and it still works. It has a European plug so I have to keep a little extra piece to plug it in. 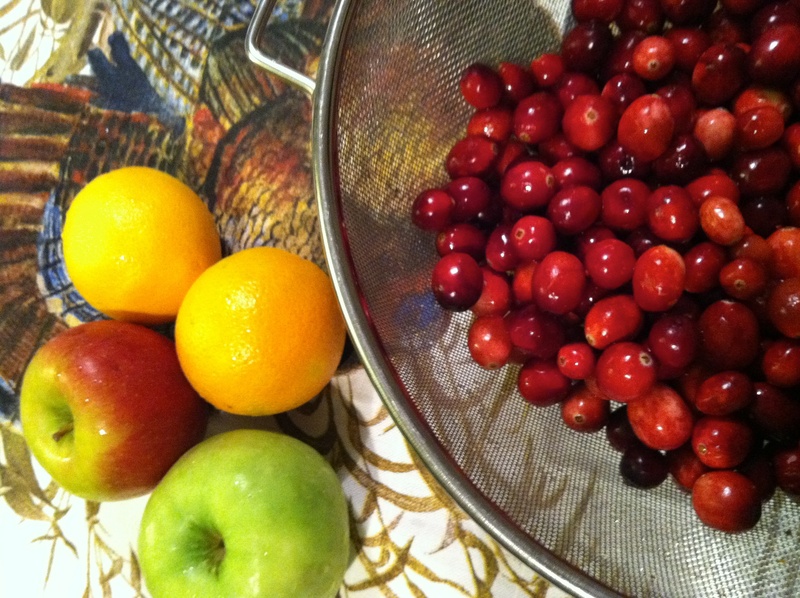 So two bags of cranberries, washed and drained, two oranges, two apples(peel on) 1 3/4 C sugar. That is all there is to it. Refreshing and tart and sweet simultaneously. And thanks to Susan K for the Turkey towels. Very festive. Happy Thanksgiving. I will put the bowl in a cardboard box so it doesn’t spill and drive to dinner at the other Grandma’s. A poetry friend emailed and told me they were dismantling the roof. I drove by after school Tuesday, rain and gray. A huge chain link fence has been erected around the perimeter. I could see what she noticed and why she thought it might be an interesting photograph. It felt sad. 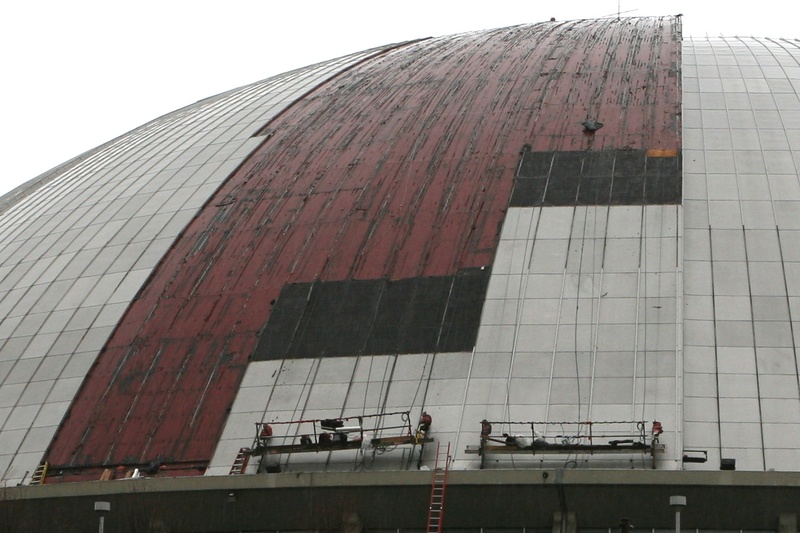 My friend V says she remembers when the Civic Arena was built(1961) and that the roof never really did work right, although it was supposed to open up to the sky in less than two minutes according to what I read about it. 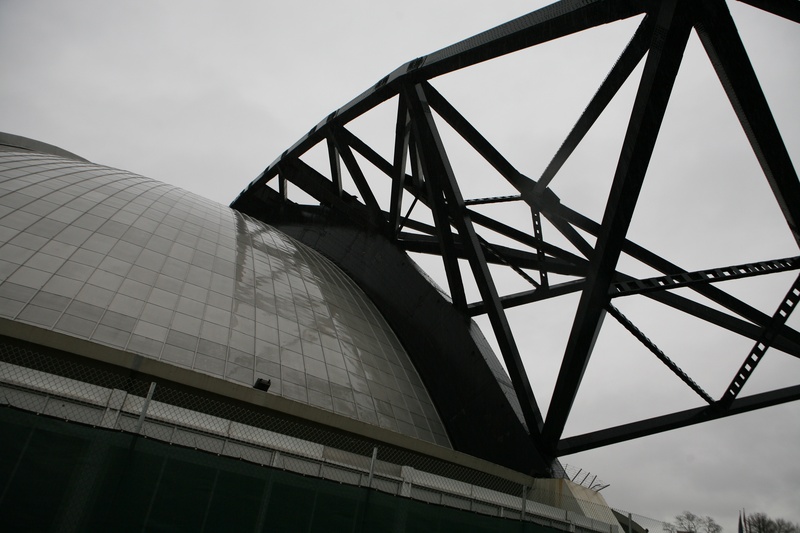 And the Penguins play at the new Consol Energy Center built down the hill from the old Arena. 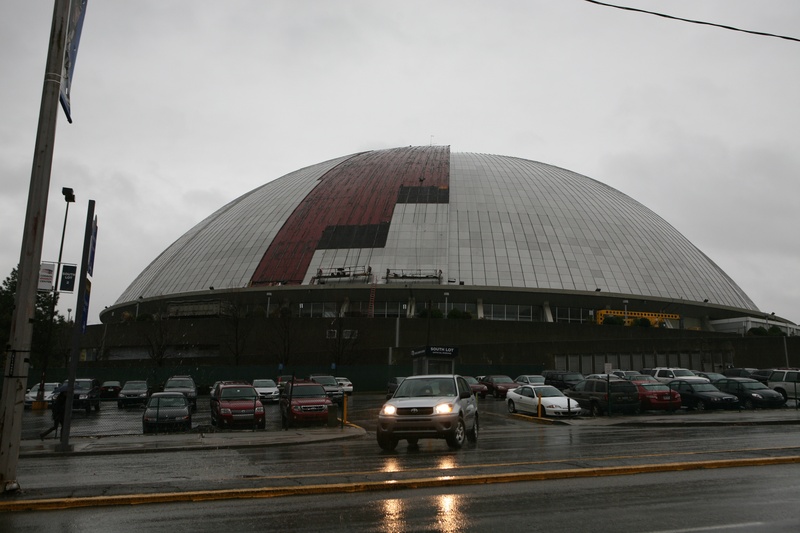 Here is phase one, the beginning of the tearing down of the Mellon Arena. Lots of memories for many people. I have shot an engaged and a wedding couple with the Mellon Arena as the backdrop. Renaissance Hotel- Columbus Ohio. 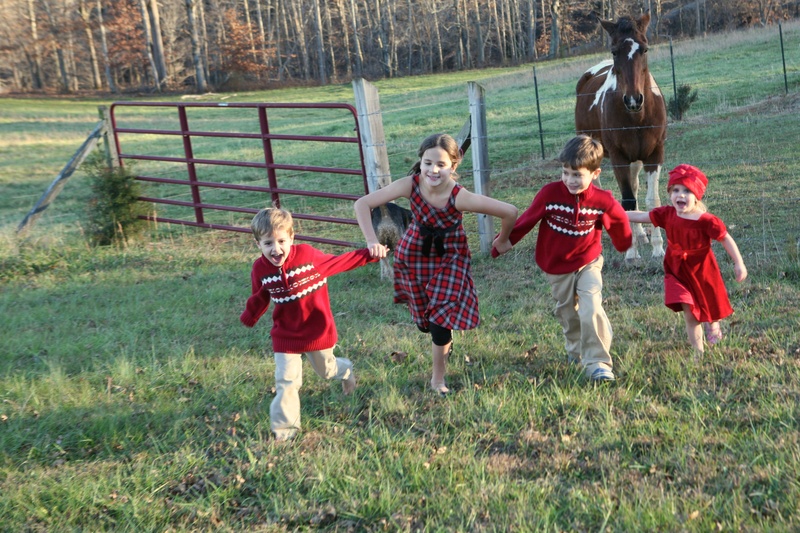 Last week- Friday- 11-11-11. My brother and sister ate the Steel Cut Oatmeal and fruit. 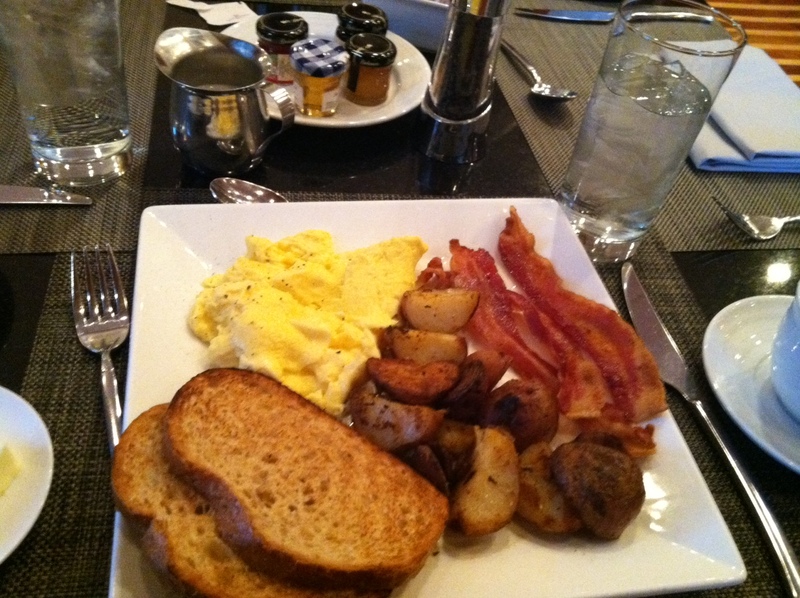 I had the two eggs, potatoes and bacon with wheat toast. I should have captured theirs to contrast my plate. Many wonderful Breakfasts by fellow bloggers this week so you might want to check them out if you are hungry. Everything from Porridge to Quail Eggs. 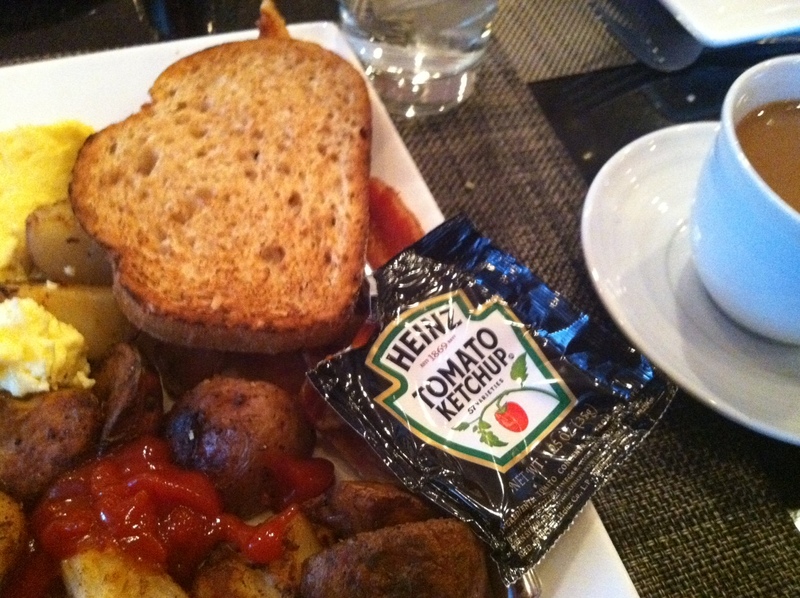 Most days it is a cup of coffee and toast for me as I fly out to school but here is what I ordered at the fancy hotel.